With over 25 years experience, I have built up a reputation for long-lasting, affordable quality, and I am pleased to say that the majority of my customers are either existing customers or from recommendations. You can rest assured that only the best materials will be used. I am constantly investigating new paint technology so that I always recommend the best material for the job. Outstanding knowledge of the new paint processes. No split or lapped seams, always an excellent finish. Dulux Select approved decorator with £1 million public liability, checked every year by Dulux. Approved by Trading Standards in the Bracknell Forest Council Buy With Confidence Scheme. 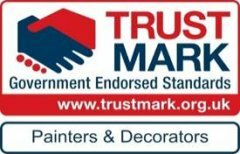 Registered with TRUST MARK, the Government Scheme endorsing standards. © Copyright 2017 Barry Lambe.